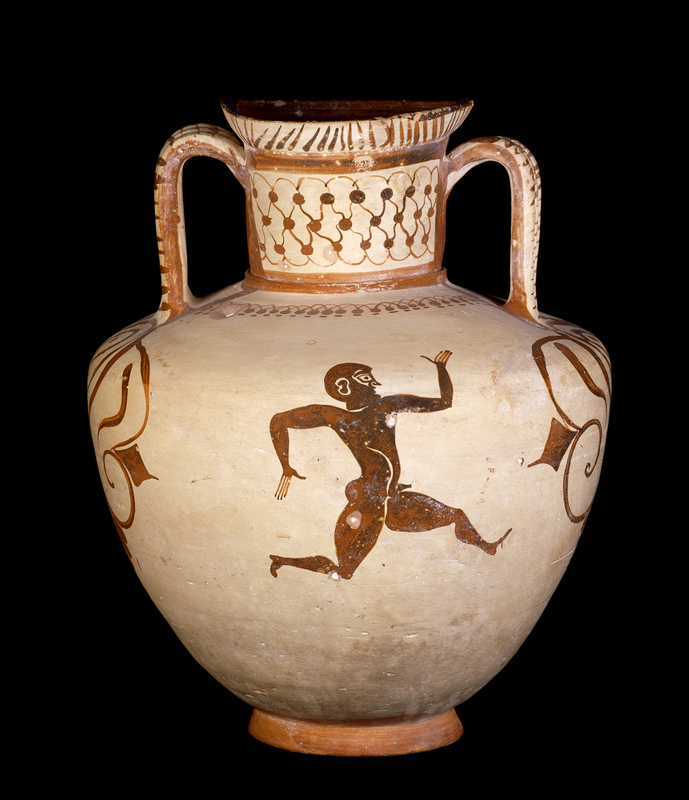 Senior Curator Judith Swaddling uncovers the ancient Greek origins of the long-distance endurance race, revealing the original 'marathon runner'. The steady rhythm of three long-distance runners. Adapted from a Panathenaic amphora made in 333 BC. 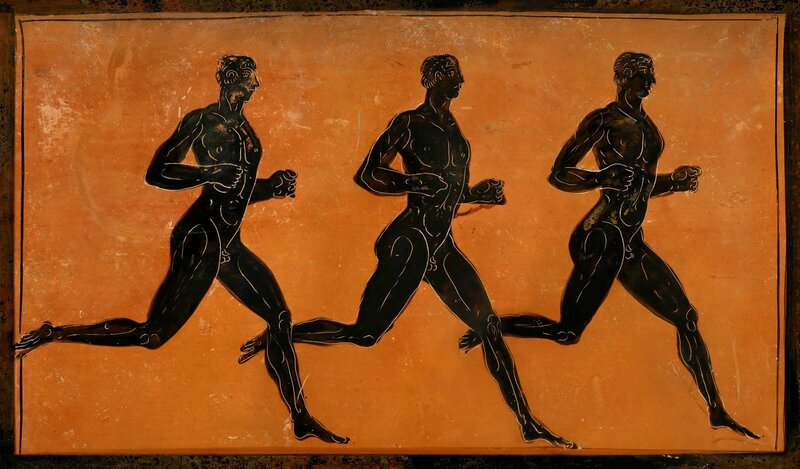 Although never part of the ancient Olympic Games, the marathon does have ancient Greek origins. According to the Greek historian Herodotus, when the Athenians learned that the Persians had landed at Marathon on the way to attack Athens in 490 BC, a messenger named Pheidippides ran to Sparta with a request for help. This original ‘marathon runner’ covered 260 kilometres of rugged terrain in less than two days! The Persians were subsequently defeated at the Battle of Marathon. The word marathon is the Greek word for fennel, which seems to have grown in the area and gave the battlefield its name. 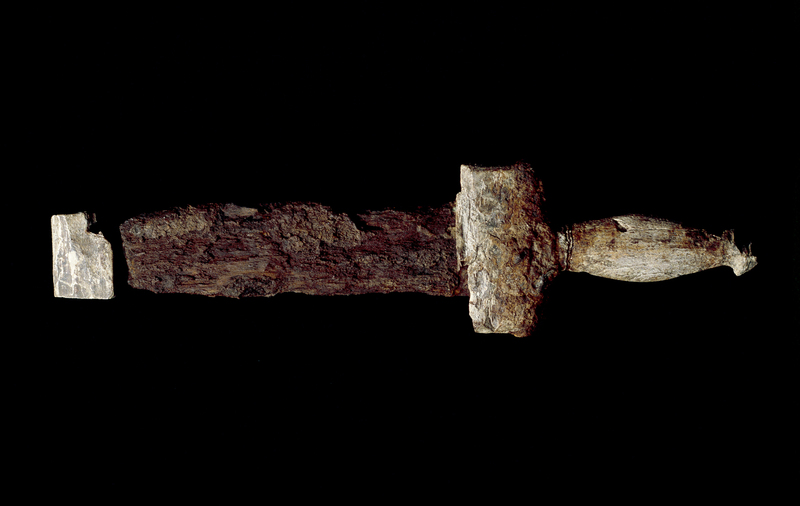 A dagger found at Marathon. Greece, 5th century BC. Running was a key part of the ancient Olympics, although long distance races were not initially included. The stadion (or ‘stade’) race, a short sprint, was the most ancient – and indeed the only – event at the first 13 Olympiads. This is where we get the modern word ‘stadium’ and its winner had the Olympiad named after him. The track was not circular but straight, and measured approximately 192 metres. The vigorous action of a sprinter. Amphora made in ancient Greece, c. 550–525 BC. Gradually other footraces were added to the programme at Olympia. The diaulos, named after the musical double pipes, consisted of two lengths of the stadium, while the dolichos was a long-distance race, consisting of 20 or 24 lengths. The greatest Olympic runner of all was Leonidas of Rhodes, who won all three events at each of the four Olympiads between 164 and 152 BC. For a runner to maintain such a peak of fitness (all the running events were held on the same day) for 12 years was a remarkable feat and such was the pride of his countrymen that he became worshipped as a local deity. The steady rhythm of three long-distance runners. Panathenaic amphora made in 333 BC. The marathon as we know it today was not an event until the modern Olympic Games in 1896, and even then it varied in length. The first modern Olympic marathons were around 40km (25 miles), which is approximately the distance between Marathon and Athens. The marathon is the final athletic race in the Olympics, usually finishing in the stadium. The now standard length of 26 miles and 385 yards was originally run in the 1908 Games in London. 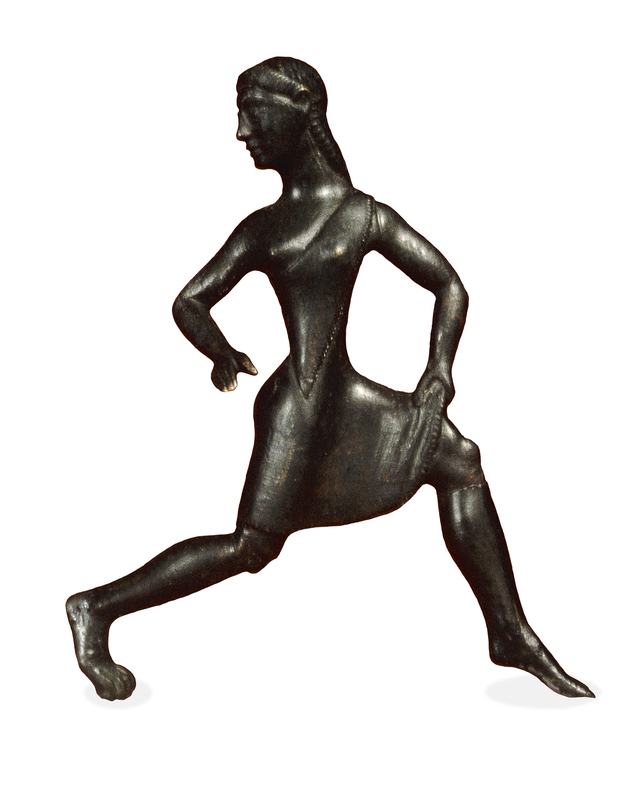 Bronze figure of a running girl. 520–500 BC. Women were excluded from competing in the Olympic Games, but they did have a festival of their own at Olympia. This was the Heraia, or games held in honour of Hera. These were also celebrated every four years, but there was only one type of event – the foot-race. It was divided into three separate contests for girls of different age groups. The winners were given crowns of olive like the Olympic victors, and they also received a portion of a heifer sacrificed to Hera. Just as the Olympic prize-winners were allowed to dedicate statues of themselves, so the girl victors were granted the privilege of setting up their images in the temple of Hera, but these were paintings and not statues. At Sparta, girls seem always to have undertaken the same athletic exercises as boys, because tough, strong mothers were believed to produce good Spartan soldiers. The bronze statuette of a girl runner above is probably from Sparta, where women were also expected to take part in athletics. Her appearance corresponds well with the ancient Greek geographer and writer Pausanias’ description of the girls who raced in the Heraia: ‘Their hair hangs down, a tunic reaches to a little above the knee, and they bare the right shoulder as far as the breast.’ (Description of Greece V 16.4). Find out more about the ancient Olympic Games with Judith’s book The Ancient Olympic Games, available in the Museum’s shop.